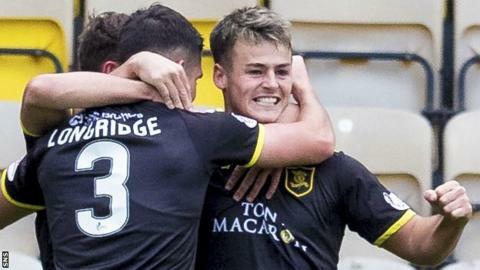 St Mirren have signed striker Danny Mullen on loan from Championship rivals Livingston pending a permanent transfer in January and a "five-figure fee". The 22-year-old was out of contract with Livi in the new year and his present club say they "regretfully" agreed to the emergency loan. "Thereafter, he will then be transferred to St Mirren Football Club on a full-time contract," they said. "Livingston FC will receive a five-figure transfer fee for Danny." St Mirren sit second in the Championship table, seven points ahead of fourth-placed Livingston and a point behind Dundee United. Delighted Buddies manager Jack Ross told his club website: "I'm surprised we were able to get a player of his quality because he's a player I've been aware of since he was a teenager at Livingston and I've always kept an eye on his progress. "I've always felt he's a player who'd get an opportunity at the highest level in Scotland." Mullen came through the youth ranks at Livingston after switching from Aberdeen in 2012 and has made 17 appearances this season, scoring five times. Livingston pointed out on their website that he "was free to sign with another club on a pre-contract from 1 January 2018". "He had already indicated to the management team that he was looking to move on in the summer," they added. St Mirren announced that Mullen had joined them "on a 28-day emergency loan from Livingston" but made no mention of the permanent transfer. Mullen, who could made his debut in Saturday's match at home to Dunfermline Athletic, added: "I'm looking forward to getting started. I'm not just coming to make the numbers up. "I'm coming here to get a place in the team and impress the manager in the short time I'm here, but I'm really looking forward to the challenge ahead. "I can't wait to get into training on Thursday and get started."